Chris talked about the committed volunteers working for the Farmmwormer Ministry at $5.00 a day plus board and room! He spoke about them as “priest workers,” and I knew he was talking about women and men, and mostly Protestant at that. It intrigued me! I was well aware of the Priest Workers in France and Germany—“A noble experiment” as Pope Pius XII called the effort when he put an end to it. They were Catholic priests who went to work in factories and other environments in an effort to bring Christ and His Church closer to those who had been “de-Chrstianized"after the industrial revolution, especially in post-WWII Europe. 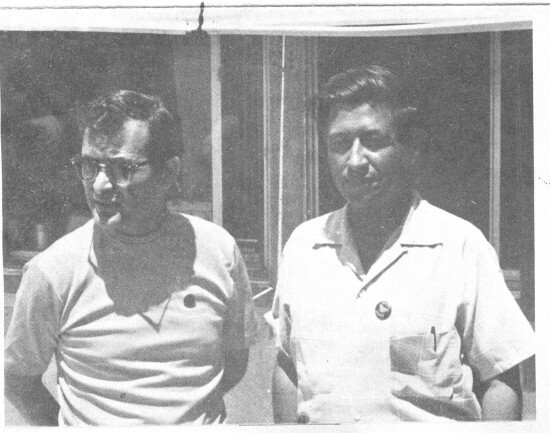 Later in 1966, I got an invitation to attend a talk by Cesar at the Franciscan parish of Our Lady of Guadalupe Church in San Jose located within the barrio of Sal Si Puedes where Cesar grew up. His audience was mostly, if not exclusively, Catholic priests. He affirmed that most of the conflicting parties were Catholic: Ranchers of Portuguese and Italian descent/wrokers who were mostly Mexican and Filipino. Cesar bawled us out, or rather challenged us, “Rabbis and Protestant ministers are supporting us strongly, but WHERE ARE MY CATHOLIC PRIESTS? !” It worked, and I decided to become an active supporter of UFW when and how I could. From the pulpit and in adult religous formation, I spoke of Cathoic social teaching that affirmed the right of workers to organize unions, and gave the current example of the efforts of the UFW. My next assignment was in north Orange County that, at the time, still belonged to the Archdiocese of Los Angeles. It was an up scale bed-room community that had outgrown its orange and alvocado-grove roots, I did not succeed a priest, but was an “add-on.” The result was that it gave me “extra” time to actively engage in the lettuce boycott and other pro-Union activities. When I recruited some of the local high school kids to help hand out leaflets encouraging consumers to BOYCOTT LETTUCE/GRAPES, that did not sit well with many of their parents. I, of course, heard about their displeasure through an Archdiocesan official. The national headquarters for the National Farmworker Ministry headed by Chris Hartmire was located in Los Angeles, not far from our Chancery Office. Chris several times invited me to join ecumenical/inter-religious delegations to the managers of food chains requesting them on moral grounds not to stock items that farmworkers were boycotting unless they had the BLACK EAGLE Union Lable. They were mostly successful, but not always. By late 1972, I was released from the Archdiocese of L.A. for “special ministry”(as ececutive director) with the PADRES organization based in San Antonio, Texas. Our family home in Lincoln Heights (northeast L.A.) was unused for a time, and Chris Hartmire asked to use it as a temporary hedquarters for Cesar and his staff plus his two German shepherds Boycott and Huelga. I am the youngest of three boys, and was away in San Antonio. My oldest brother, an officer in the Airforce, was out of the country. My middle brother (who last year celebrated his Golden Jubilee as a priest) was pursuing a doctoral degree in Hebrew Scriptures at Harvarfd that he finished at Princeton. Meanwhiile dad, a widower for a few years, was in the seminary studying to become a Claretian priest. Dad gave his permission, and the family home became the temporary HQ for the victorious UFW “No on 22” Campaign. In August 1973, I got a “special vacation” courtesy of Fresno County. Together with severfal hundred people, I was in jail for almost two full weeks. Early in the morning, I had been “master of ceremonies” for a rally at which Cesar was featured. “What will you tell your grandchildren about this day? What did you do?” Many of us went to join the picket line at a ranch where supporters were being arested for civil disobedience. I rode in a car from Parlier Park to the picket-site with Doroty Day, a New York socialite-turned Communist who became a convert to the Catholic Church and an apostle to/for the imporverished. “The first time I went to jail, I was the youngest. Now I am the oldest.” At the site, Dorothy sat down on a stool and read from Matthew 5—The Sermon on the Mount. I know, because I heard her proclaiming it aloud. At the episcopal ordination of Archbishop Sanchez of Santa Fe, Cesar teasingly told me in July 1974, “We have to stop meeting like this.” We had previously met at the episcopal ordinations of Bishop Patrick Flores on Cinco de Mayo, 1970 when he proclaimed a reading at the San Antonio Stadium. We had also met at ordination of Gil Chavez of San Diego in April 1974, a few months before +Archbishop Sanchez was ordained a bishop.